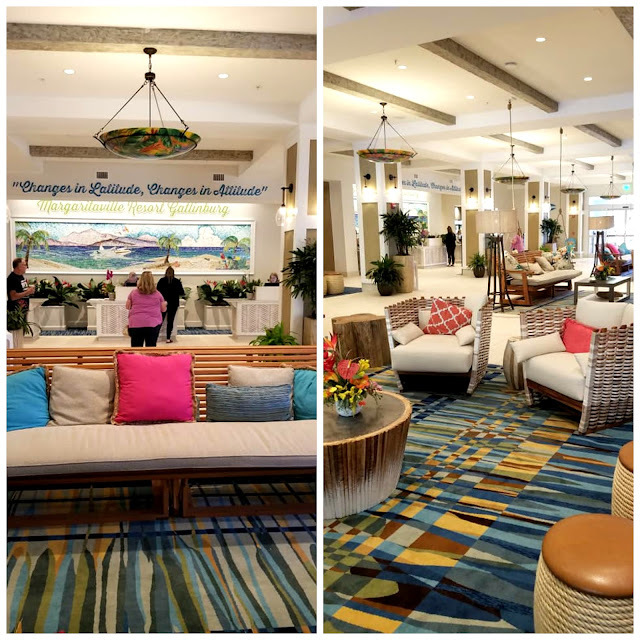 I partnered with Margaritaville Resort Gatlinburg on this post. All thoughts are my own. You know the song, the famous man behind it, and the carefree attitude that comes along with a simple change in latitude. Margaritaville is more than just a paradise that people dream about, it's a state of mind. 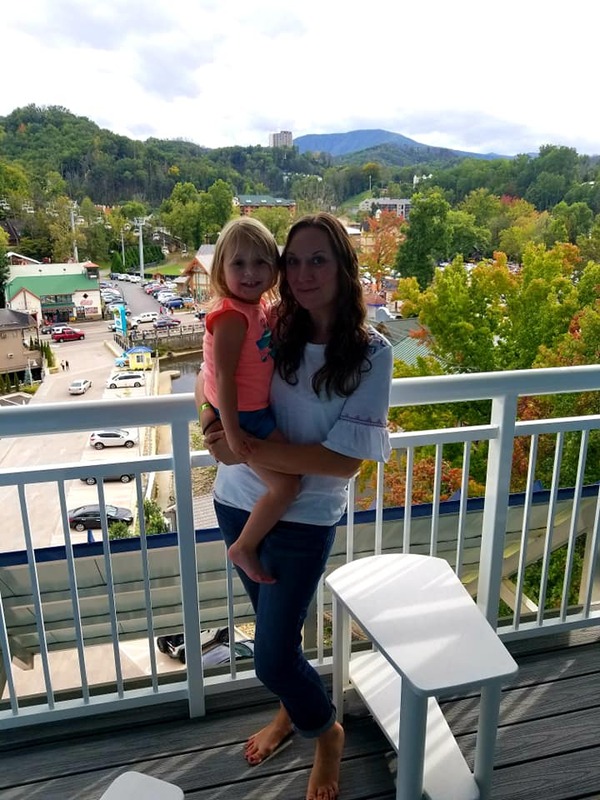 It's also a beautiful and luxurious, yet family-friendly resort nestled right along the river in downtown Gatlinburg, TN. 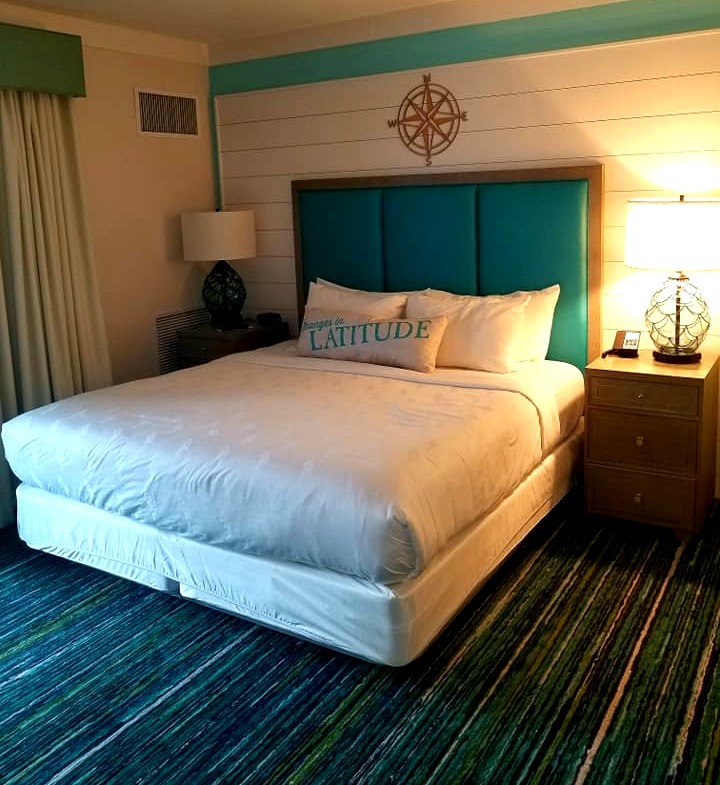 If you've been dreaming about an escape from the every day, and looking for a resort that truly has it all, it's all waiting for you at Margaritaville Resort Gatlinburg. Everyone needs to take a little time to relax and unwind every now and then, and that's exactly what my family and I did in early October. Fall break and my son's eighth birthday all fell within the same week this year, and it was the perfect time to get away and enjoy a little family time. When it came to choosing a destination, we knew we couldn't go too far from home, but wanted to be somewhere a little different. The mountains are so beautiful this time of the year (and anytime, really), so we decided to drive a few hours west to Gatlinburg, TN, home to the Margaritaville Resort. 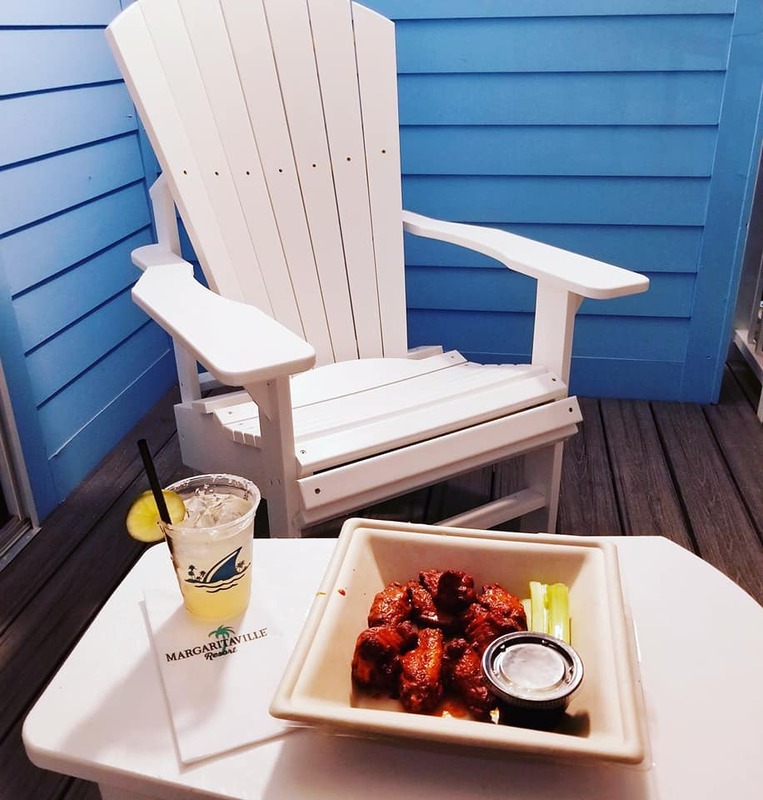 Margaritaville Resort Gatlinburg is a gorgeous 4-Star Resort, located in the heart of Gatlinburg, a busy, but quaint little town in the gorgeous Smoky Mountains of Tennessee. 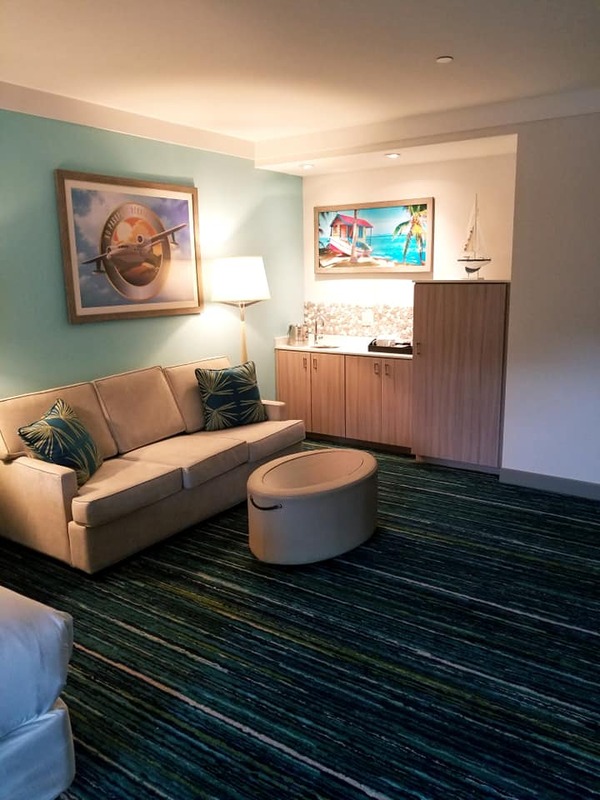 The spacious resort offers stunning rooms, fabulous amenities, an on-site spa, along with a cafe, bar, and the Landshark Bar and Grill, just next door. With an outdoor swimming pool and splash pad, a relaxing hot tub, and spacious indoor heated pool, your family will never run out of ways to have fun during their stay! These were just a few of the reasons that we were drawn to the resort, and the real treat came once we arrived, and checked in! 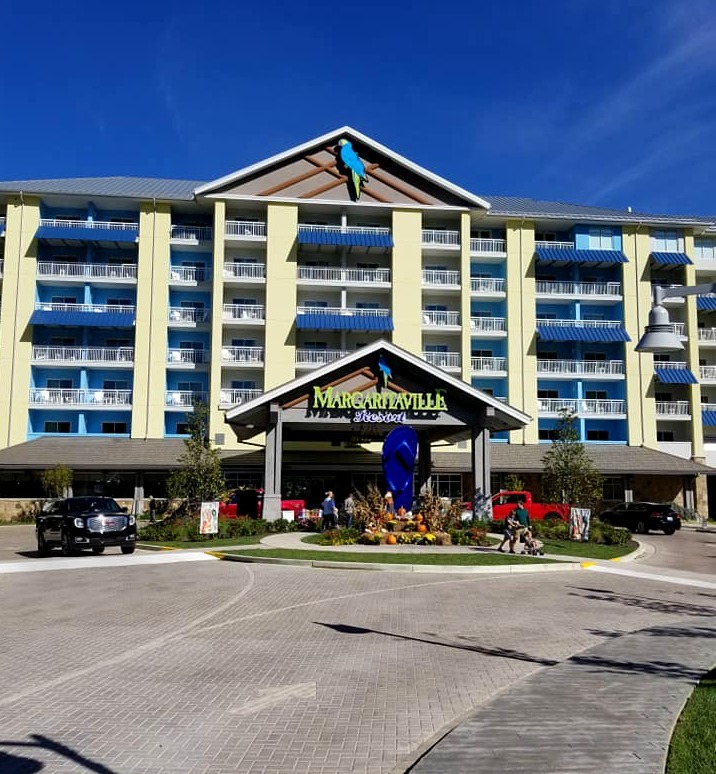 Upon arrival at Margaritaville Resort Gatlinburg, we were greeted by friendly staff who were ready to help us with our bags. We checked in at 4 pm, which was perfect timing. As I checked us in at the front desk, Sacha and the kids sat in and enjoyed the absolutely stunning lobby. We felt like we were sitting somewhere in the tropics, yet right in the heart of the Smokies. The lobby was so clean, bright, and inviting. The furniture was lush, comfy, and begged to be sat upon for while. I know my kids felt like they could have sat on the platform swinging couches forever! When we were ready to head up to our room, we stopped to check out the indoor pool and fitness center. I knew I probably wouldn't get to spend any time in the fitness room, but it looked amazing and offered everything that you could want if you love to exercise when you're away from home. We took a short elevator ride up to the seventh floor, which happens to be the very top floor, with the most amazing views! 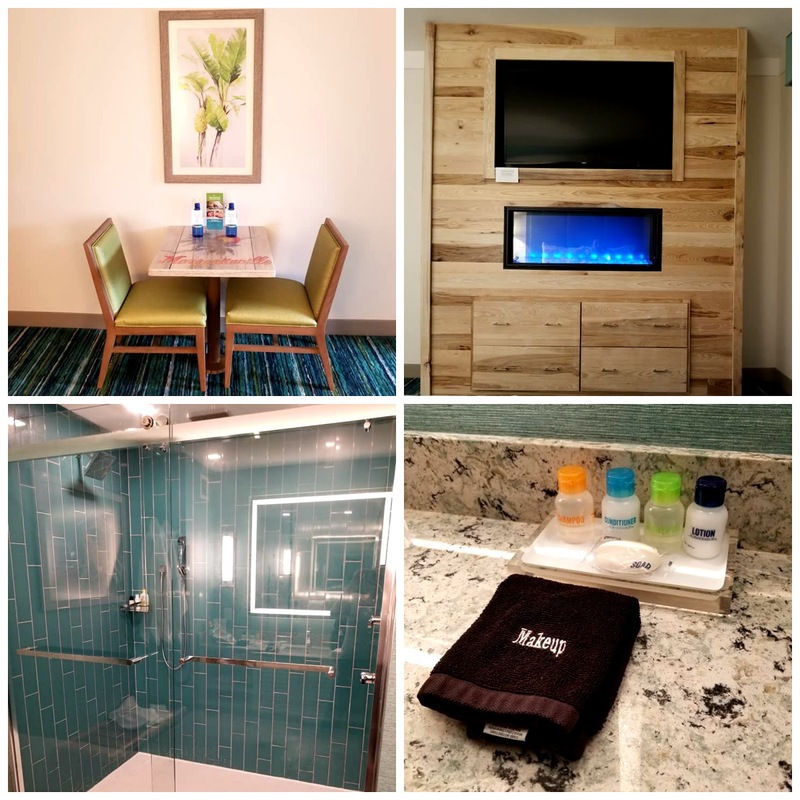 Our room at Margaritaville Resort Gatlinburg was everything we could have hoped for, and so much more! A room for rest, relaxation & family fun! When we opened up the door to our room and walked in, our eyes absolutely lit up. I felt like someone had transported me out of tired mom mode and ushered me into paradise. Our room was a king suite with a queen sofa bed, and had so many fabulous amenities! Let's talk space... as in floor space. If you have kids, you need it, and friends, this room had a ton of space! We never once felt cramped, and everyone had plenty of room to sprawl out, play, eat and drink, and just plain relax. We had a beautiful and comfy modern sofa, which was so spacious, we could all sit on it together. The sofa pulled out and converted to a queen sleeper, which our eight-year-old loved sleeping on. He said he felt like a king on his birthday! The roll-away coffee table was the perfect place for the kids to color, play on their tablets, and enjoy a snack while watching the big screen TV. 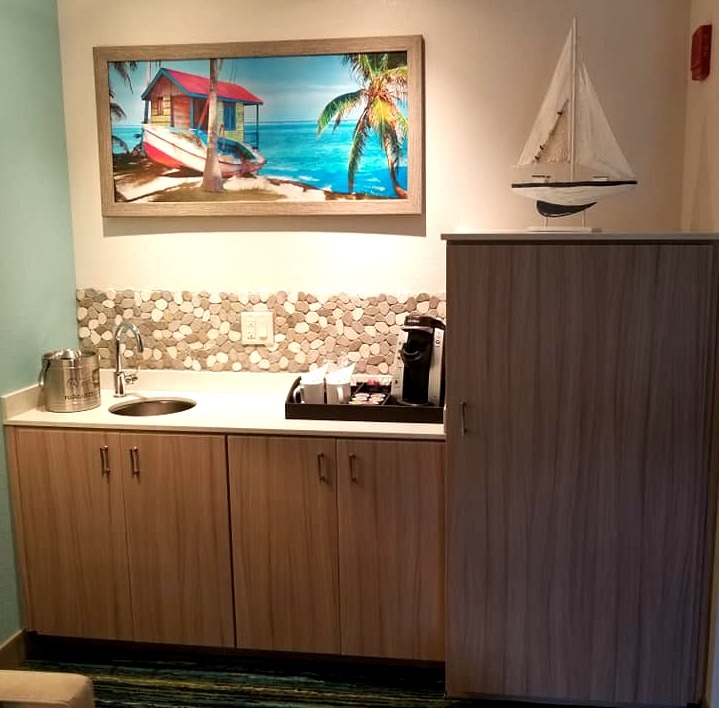 Over to the side of the couch and coffee table was a wet bar, featuring a small sink, Keurig coffee maker (along with coffee pods and everything needed for morning coffee, right in the room! ), and an ice bucket. Tucked into a cabinet was a microwave and small refrigerator. This was so incredible to have. When we travel with our kids, we always wind up needing to refrigerate food and beverages. I wish my bed at home was this amazing! Thanks to this amazingly soft, comfortable and luxurious king size bed, we slept like babies! Our toddler often winds up in bed with us, so we had plenty of room to enjoy a solid night's sleep (two nights in a row) during our stay. This was the first place everyone wanted to be when we walked into the room. The kids saw this giant bed with tons of plush pillows, and couldn't wait to crash! We could have spent all day right here! As much as we loved the couch and bed, there was so much more to explore and love about our room! The decor was so beautiful. We truly felt like we were worlds away from home. It's the little things that make such a big difference when you're away, especially when you're traveling with little ones. We loved how spacious, bright and sleek the bathroom was! The beautiful countertops and cabinets were amazing. We had plenty of plush towels, there were toiletries already provided in case we forgot something at home, and there was even a black makeup washcloth, which I thought was so clever! The shower was phenomenal! The kids ran into it with their bathing suits on after we came in from a dip in the pool, and had such a blast standing underneath the dual rainfall showerheads! There was so much space in there, it was easier than ever to get everyone clean. I even got a little 'mommy time' in the shower, and loved every second. It was so relaxing! There was also a wooden bench in the bathroom, which was great for laying towels and clothes on or having Bean sit on while she dried off. There was a hairdryer provided, and there were even two beautiful bathrobes hanging in the closet for us to enjoy during our stay! The little bistro/cafe table with two chairs was a great spot for the kids to enjoy breakfast each morning in the room, too! One of the best parts of our room was the stunning electric fireplace, built right in, sitting underneath the TV on the wall in front of the bed. The dancing blue light from the fireplace was so relaxing to look at, and just one of those amazing perks of staying at this wonderful resort! Relaxing outdoor balcony with incredible views of Gatlinburg! I am so spoiled. I do love a room with a view, and honey, this room had one of the best views in any hotel or resort I've stayed in thus far. Our top floor balcony overlooked downtown Gatlinburg which was busy, yet quiet, with mountain views all around! I loved waking up and sitting out on the balcony with my cup of coffee each morning before anyone else was awake. It was the perfect way for me to start my day in a gorgeous setting. A little downtime for mom and dad. 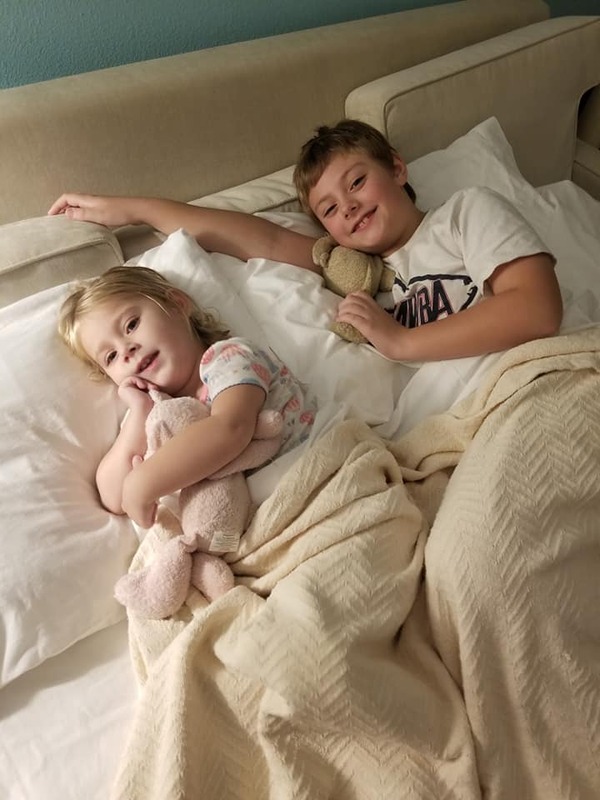 We spent a full day at Dollywood during our visit to Gatlinburg, and when we returned to Margaritaville Resort at the end of the day, we tucked the kids into bed and had a little grown-up time out on the balcony. We were treated to an appetizer of delicious wings and drinks from the License to Chill Bar, down in the lobby. Hubby actually went down and ordered the food and drinks and brought them back to the room while I got the kids to sleep so we could enjoy a little quiet time together. The air was crisp, it was dark, but the sky was aglow with the sights of nightlife in downtown Gatlinburg. Our wings were so tasty, and of course, it wouldn't have seemed right not to sip on cold margaritas! Side note- it was one of the best margaritas I have ever had! We were so glad to be there with the kids, but both agreed that we would have to plan another trip back to the resort, just the two of us. It's such an incredibly relaxing and beautiful place for couples to enjoy a little time together. Sparkling waters, fire pits, outdoor lounging, and more! When the kids had slept a long, full night, they couldn't wait to hit the pool again the next morning! The pools at Margaritaville Resort Gatlinburg are so awesome! Outside, there's a huge swimming pool with a super fun waterslide! It was a little too chilly for B to enjoy the waterslide on this trip, but he's already earmarked it for next time! There are plenty of chairs to lounge in while you enjoy the sun and music on the pool deck. There's also a zero-entry splash pad for the kids, which sprays and dumps water for extra fun and excitement! An indoor heated pool provides a warm swimming spot, and a steamy hot tub is a perfect place for guests to slip away and enjoy a little quiet time. Across from the pool area is an outdoor firepit with cozy seating, as well as hanging hammocks for your relaxation and enjoyment! If you walk around the pool to the other side and through the pool gate, you'll find yet another outdoor fire pit, and outdoor lounge, complete with cozy seating and an outdoor fireplace. Don't make us leave mom, we want to stay forever! On our very last morning at Margaritaville Resort Gatlinburg, we were all pretty bummed that it was time for us to head home. We so enjoyed our room- the amenities, space, the wonderful sleep we got, and the beautiful views. Plus, the resort offered so many wonderful things for us to see, do, and enjoy! We could have not left the resort at all during our time in Gatlinburg, and been happy as clams. Before leaving the resort, B was treated to a special bakery item from Joe Merchant's Provisions right off of the lobby! He was able to choose a treat for his birthday and enjoyed a chocolate muffin (the best he's ever had, he said!). You can also grab light bites, breakfast plates, and coffee! If you need a snack, there's also an amazing snack bar, or pantry, where you can purchase just about anything you could need or want! There's even a Margaritaville shop to enjoy, with lots of fun souvenirs, t-shirts, and fun things for the kids, too. Stop by Margaritaville Resort Gatlinburg to take a few family photos with this gorgeous fall backdrop! 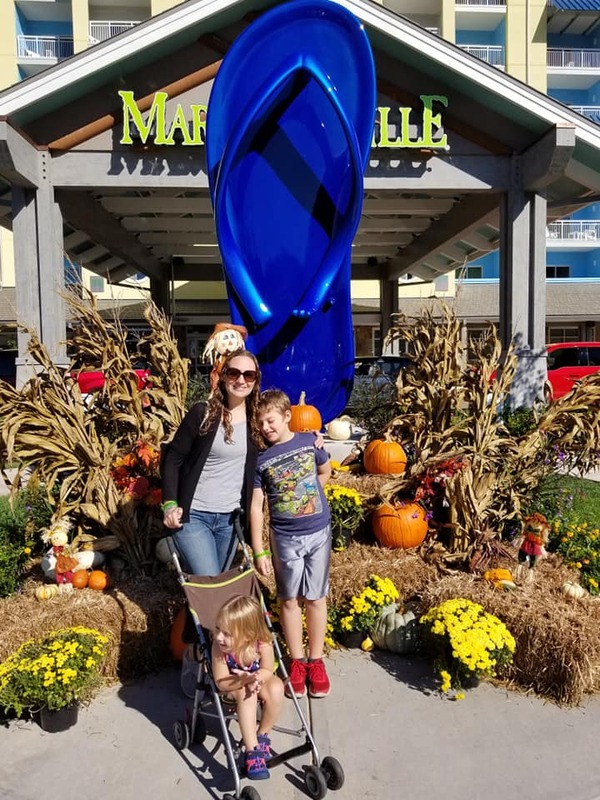 We had an incredible time at Margaritaville Resort Gatlinburg. We couldn't have celebrated B's birthday in a better place, and everyone truly went out of their way to make him feel extra special! The resort is so beautiful, and I am absolutely positive that you will love it! If you're thinking about planning a trip to Gatlinburg- be it for a honeymoon, anniversary, special occasion celebration, or just an escape with the family, this is the place to stay! I can't wait to go back and enjoy the spa services, and spend a little more time just chilling out in this paradise in the Smokies! Want to go? Plan your visit! 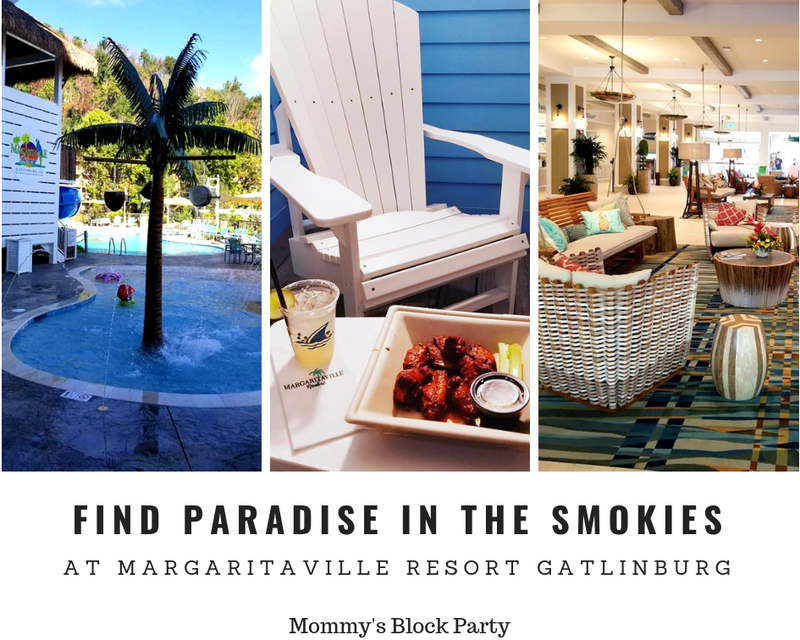 Head to Margaritaville Resort Gatlinburg to learn more about the resort and all of its fabulous amenities, or to book your stay! The resort has everything you need for a relaxing time away from home in the gorgeous Smoky Mountains! The resort sits right along the river, and is within walking distance to area attractions, shops, and dining! Want to see more? 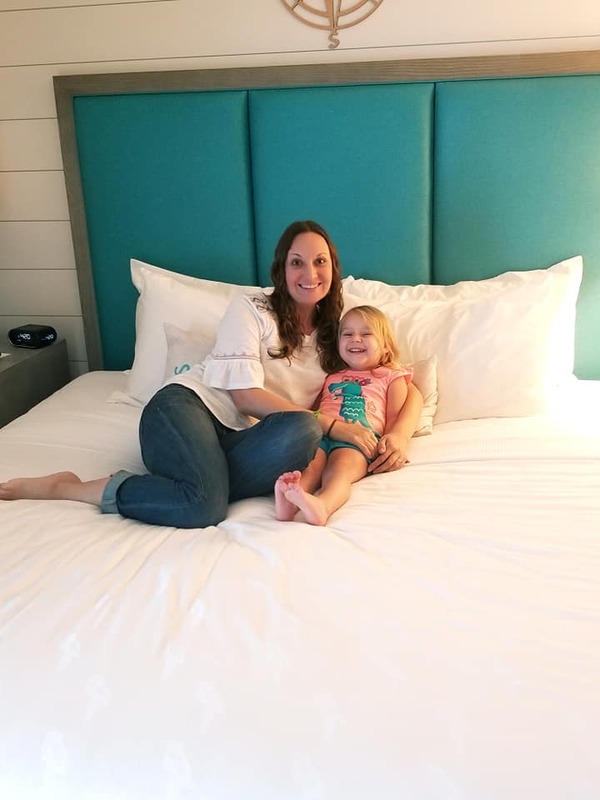 Check out my video tour of the room we stayed in and enjoyed at Margaritaville Resort Gatlinburg! Connect with Margaritaville Resort Gatlinburg on Facebook, and IG! Special thanks to Margaritaville Resort Gatlinburg for working with us and hosting us, and making our stay with them so incredibly special! 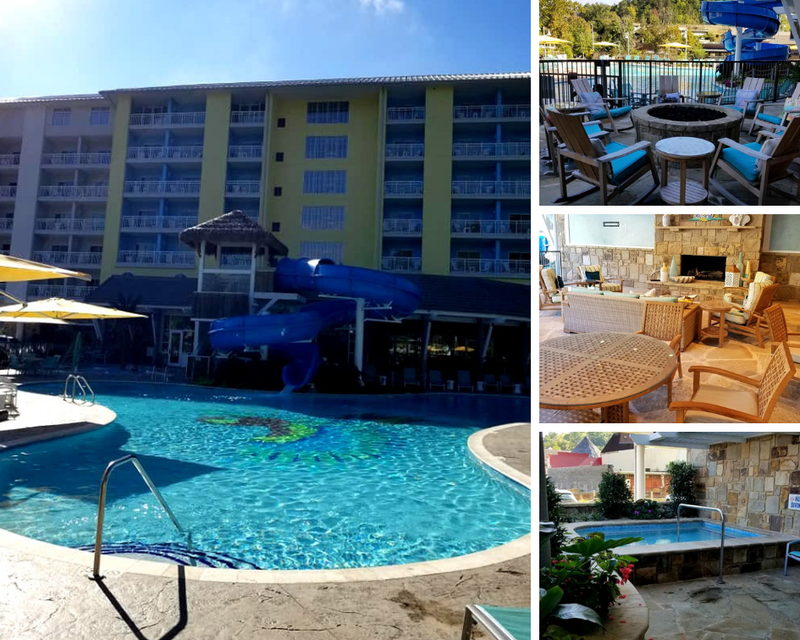 Have you ever been to Margaritaville Resort Gatlinburg? 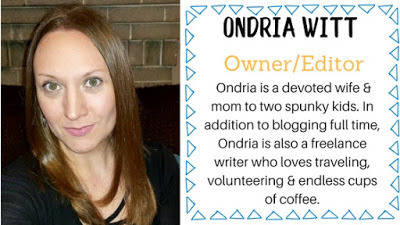 I'd love to hear about your trip, too! Wow! What a beautiful resort! We lived in TN for a few months! It was so pretty! 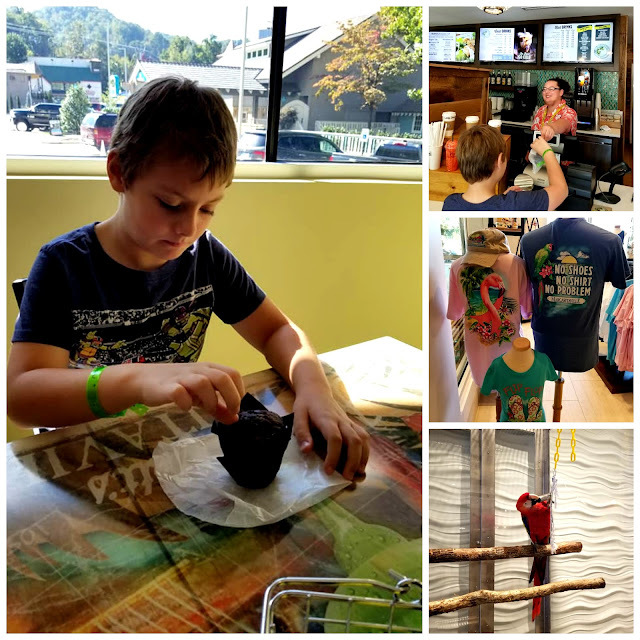 I love that Margaritaville Resort Gatlinburg is so family-friendly! It's so incredible, and there are so many amazing things to do- right within the resort! I highly recommend visiting! Oh my goodness! What an amazing place and you showed us how wonderful the spot is with the beautiful pictures! The kids look so happy and the room is amazing. My mom has talked about this place and someday I will try to take her there. Thank you for sharing. Thank you, Pam! Oh, wow- that would be such a fabulous trip! You two would certainly enjoy it. It'd be perfect for a family getaway or a girls weekend!